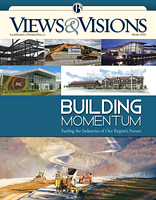 Views & Visions is our award-winning publication, offering unique perspectives on a variety of topics from leaders of business and industry, government, education and community organizations throughout our region. Our award-winning magazine brings you insights from the region's government, business and legal leaders. Guest Author: Robert C. Orndorff, Jr. Guest Author: Robert L. Beers, Jr.
JRH Associates Inc. MHLP, LLC. Guest Author: The Honorable Glenn F. Elliott, Jr. The Triple Aim: (What’s So Funny ‘Bout) Better Care, Healthier Populations and Lower Cost? How Well Do You Know Your Fourth-Parties? Guest Author: J. Morgan Leach, Esquire - Co-founder, West Virginia Hemp Farmers Cooperative, Inc.